To ensure the Verde River flows for generations to come. To support native wildlife and vegetation, a healthy watershed, and places of stunning beauty. To inspire stewardship among residents and visitors in support of the river we love. Join us at Pillsbury on the last Friday of the month for Hatty Hour and support Verde River conservation projects. Raise a glass for the Verde River! $1 donated for every beer you enjoy! Join us on the second Thursday of each month at The State Bar in Cottonwood 3-6 p.m. The Verde River is one of Arizona’s few remaining flowing rivers. The river and its tributaries, such as Granite Creek, Sycamore Creek, Oak Creek, and Fossil Creek, provide lush corridors of life as they wind their way through beautiful, iconic, and arid landscapes. The Verde River system is an environmental and cultural treasure for local communities, the state of Arizona, and beyond. 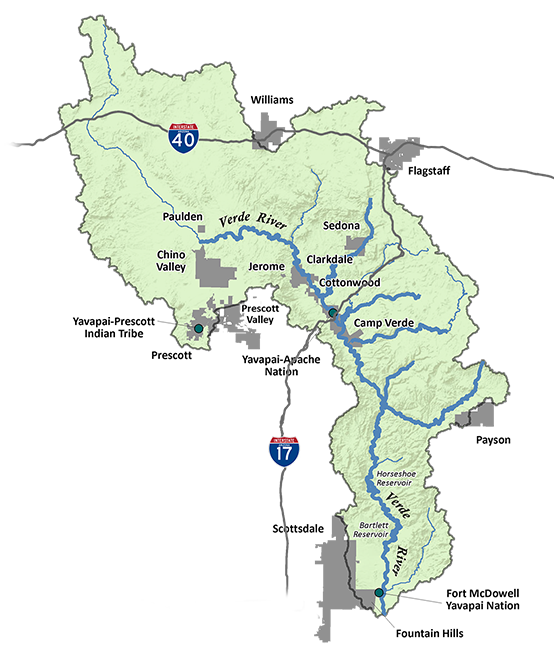 Friends of the Verde River (Friends) envisions a healthy, flowing Verde River and tributaries that support our unique environment, vibrant economy, and quality of life for future generations. We work collaboratively to restore habitat, sustain flows, and promote community stewardship to support a healthy Verde River system. We work to ensure the Verde River will flow for generations to come. We work to support native wildlife and vegetation, a healthy watershed, and places of stunning beauty. We work to inspire stewardship among residents and visitors in support of the river we love. How can Yuma teach us something about the Verde? How Are You Connected to the River? The Verde River and its tributaries are a regional, state, and national treasure. The river and humans within its watershed are inextricably interconnected. The Verde River is one of the very few remaining perennial rivers in Arizona, providing a lush corridor that stretches from Paulden through the communities of Clarkdale, Cottonwood, Yavapai-Apache Nation, Camp Verde, and the Fort McDowell Yavapai Nation before it makes its way to the Phoenix area. The Verde River and its springs are essential to the cultures and traditions of many native peoples from the ancient Sinagua and Hohokam peoples to present day Yavapai, Hopi, Apache, Zuni, and other tribes.